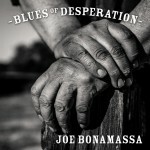 Share the post "Album review: JOE BONAMASSA – Blues of Desperation"
He actually saves his most climactic solo to rescue the overwrought blues ballad ‘No Good Place For The Lonely’, which overcomes a horrible synth fill and overbearing faux strings to achieve an unlikely triumph. ‘Blues Of Desperation’ lives up to its name in a positive way, as it sounds like the work of a performer taken out of his comfort zone and pushed to a new high. The album reinforces Joe’s own style through self penned songs, while harnessing some of his most fiery solos in recent times. As a guitarist, Joe proudly stands at the top of his own mountain to survey the great beyond, while refusing to believe that’s all there is. Recorded as a power quartet (although there are some significant keyboard parts), the main inspiration behind the album appears to be producer Kevin Shirley’s fascination with Led Zeppelin style bombast. To that end he’s recruited a second drummer Greg Morrow and added bv’s to smooth out the jagged edges. Look no further than the bone crunching riffs of ‘Mountain Climbing’ as the first of several examples of a flashback to the early 70’s, though newer fans will doubtless rejoice in Joe’s fiery attack, as his solo slashes through the enveloping backing track. Leading into this album Joe says he wanted to do explore new horizons in the blues. And he does so, on an album that tempers a big shoulders rock approach with heartfelt blues sensibilities. The opening ‘This Train’ uses the first of two familiar train metaphors, the former being a slide-led opus on which he pushes his vocal to the limit to bring gravitas to some workaday lyrics, as his incendiary soloing seals the deal. ‘Distant Lonesome Train’ employs a pungent drum pattern, before he stretches out in a stellar display of guitar mastery, nailed by big wall of sound and stereo panning. The sourly titled ‘You Left Me Nothin’ But The Bill And The Blues’ actually gives the album a lift, via a tension building piano-led bridge, which is resolved by two succinct solos with a gnawing tone. Since becoming a national Top 10 chart topper with ‘Sloe Gin’, Joe has been treading a delicate line between staying innovative, while satisfying fans expectations. But producer Shirley knows his pupil well, as half way through the song Joe’s solo takes off like a jet plane in a blaze of heavy guitar-driven intensity over deft electronics and an eerie drop down. This entry was posted in ALBUM REVIEWS, ALBUM REVIEWS (Mobile), All Posts and tagged album, blues, Blues of Desperation, Delbert McClinton, Glen Clark, Greg Morrow, Joe Bonamassa, Kevin Shirley, Led Zeppelin, review. guitar, rock, soul. Bookmark the permalink.